Home Apps Free Tetris Game App For Windows 8: Tetris! 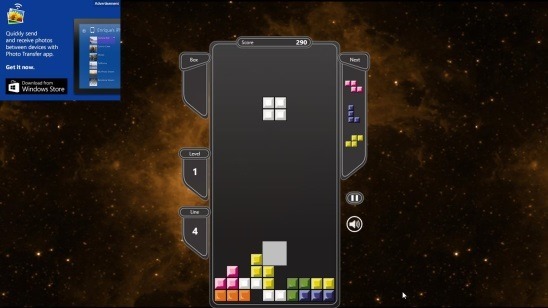 Free Tetris Game App For Windows 8: Tetris! Tetris is a free Tetris game app for Windows 8, in which you have to fit-in colorful blocks made up of squares in a row in such a manner so that the row will have total 10 squares of same color. Filling all the gaps in a row removes that particular row from the playing field, and all the top blocks above the deleted row steps down. This gives you more space to arrange and fill the gaps, thereby giving you chances to score more. As the number of rows gets deleted, your scores increases. This Tetris game app for Windows 8 is a remake of the legendary Tetris game, developed in 80s’. It is one of the well know classic blocked puzzle game, which almost everyone has played during their childhood. There are lot many versions of this game for PDAs, mobiles, video game consoles, gameboys, etc. 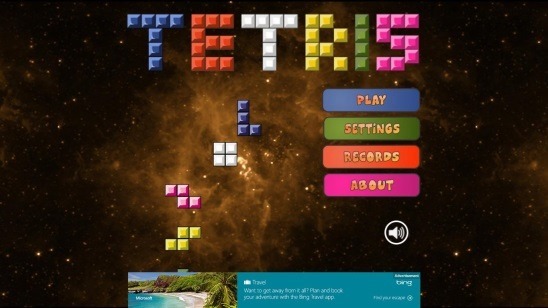 You can get this free Tetris game app for Windows 8 under the Games Category in Windows Store. As everyone know, Tetris game app consists of different shaped blocks made up of four square boxes. These blocks falls in a random sequence from the top towards the base of the playing field. You have to move these blocks left or right and fit them to the gaps in between the rows, so as to fill the entire row with same colored squares. As these blocks keeps falling randomly, and if there are some gaps in a row, then a stack of blocks gets created and once this stack reaches the top of playing field, the game get’s Over. So what you have to do is to stop the stack from reaching the top, and the only way to do this is, to fill up all the gaps of a row by rotating the falling tiles by 90 degree and arranging them in order. As the gaps get filled, the rows gets deleted giving you more scores, and like said above, all the stacks over the deleted rows fall that many rows down; hence giving you more space and time to earn more scores. Like the original Tetris game this Windows 8 version also has seven different blocks, and you can use the four arrow buttons and the space bar to rotate-move the falling blocks to right-left, or quickly drop them respectively. Plus, you can also use the mouse or finger touch (for tablets) to control these falling blocks. The app shows instructions for how to use the controls before starting a new game by default, which you can choose to skip by going into Settings screen from the Main Screen and setting Tutorial option to Off. Besides Tutorial option setting, this screen also contains settings to Change language and turn Ghost (kind of a hint) and Music options Off. Plus you can also view your top 5 high scores and the top 50 high scores scored around the world and around United States. This game does involves brain and attentiveness, but it’s not rocket science also. Good replica as a Tetris Game App for Windows 8. Game-play difficulty rises as the game advances. Seven types of falling blocks. Tetris game app for Windows 8 is a nice remake of the original Tetris game. The game-play is fine. Though the Ghost option, in place of helping makes the game more confusing. So I would suggest you to keep it off, and the animation and controls needs a little more improvement. Otherwise, the app’s interface has got a good design and it is completely functional. Try this free app and enjoy fun playing.